#1 The job is to ask questions-it always was-and to ask them as inexorably as I can. And to face the absence of precise answers with a certain humility. #2 Maybe all one can do is hope to end up with the right regrets. #3 He’s not the finest character that ever lived. But he’s a human being, and a terrible thing is happening to him. So attention must be paid. #4 Betrayal is the only truth that sticks. #5 Everybody likes a kidder, but nobody lends him money. #6 Can anyone remember love? It’s like trying to summon up the smell of roses in a cellar. You might see a rose, but never the perfume. #7 I have made more friends for American culture than the State Department. Certainly I have made fewer enemies, but that isn’t very difficult. #8 Let you look sometimes for the goodness in me, and judge me not. #9 In the theater, while you recognized that you were looking at a house, it was a house in quotation marks. On screen, the quotation marks tend to be blotted out by the camera. #10 Never fight fair with a stranger, boy. You’ll never get out of the jungle that way. Life, woman, life is God’s most precious gift; no principle, however glorious, may justify the taking of it. If a person measures his spiritual fulfillment in terms of cosmic visions, surpassing peace of mind, or ecstasy, then he is not likely to know much spiritual fulfillment. If, however, he measures it in terms of enjoying a sunrise, being warmed by a child’s smile, or being able to help someone have a better day, then he is likely to know much spiritual fulfillment. 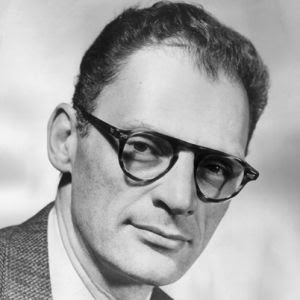 So these were the top 10 best Arthur Miller quotes. Do share the page and comment for more quotes.